So, at long last some might say, Ed Miliband is to sign on the dotted line and marry his long-term partner Justine Thornton. On the 27th May – interestingly the same day that Anthony Eden won a famous Conservative victory – the Labour Leader will sign his name on his marriage certificate and in the marriage register. Doing so will bind him both in law and emotionally to his wife. Luckily for both of them, this act of signing their name will have impact. New research suggests that when we are already connected or attracted to something, signing our name associates us even more strongly with that item. However, if we are not really that bothered, adding our name actually pushes us away from the item. In the study people were asked to sign or print their name prior to entering a sports goods shop. The people who were already associated with sport and who had an affinity for sports goods actually purchased more running shoes than people who were like them, but did not sign their name. The act of signing made them want the items even more, it seems. However, when people who did not have much of a connection with running shoes signed their name prior to entering the store, they bought fewer items than the people like them who did not sign their name. In other words, if you are strongly linked to an item and you sign your name it strengthens the connection. But if you are disassociated from a product and you sign your name, the act of signature pushes you further away from ever wanting the item. Online you are asked to sign your name constantly – in the classic “squeeze page“. 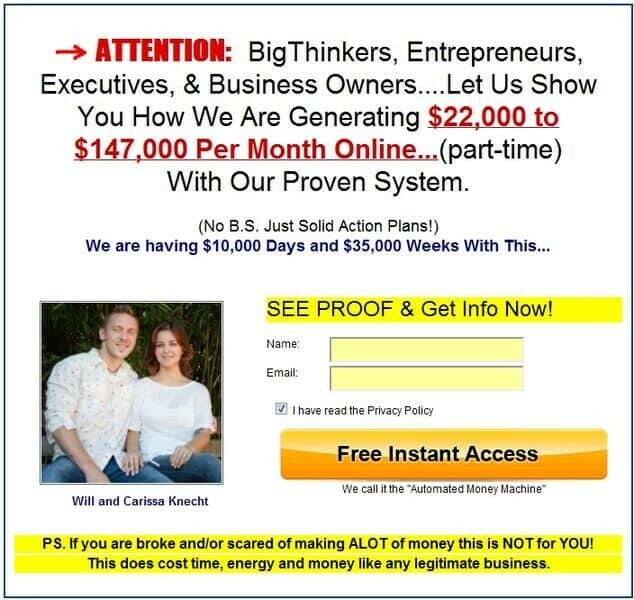 This is where some promise is made and if you add your name and email address you will get the secrets you are wanting. What this new study suggests is that if people are already strongly associated with the item touted in the squeeze page, they are more likely to buy it as a result of entering their name into the relevant box. But if these people are curious and not yet linked to the product or service, they become less likely to buy after filling in the name box. This is a potential problem for Internet marketers. If they are trying to attract people to buy their products having a squeeze page could put people off when you ask them for their name. However, there are potential riches from getting people to sign their name too. Which way to go? The answer is simple, though much harder work than many of the Internet marketers might want to do. What you need to do is have two versions of the sales page – one for associated people, where you ask them to print their name, and one for non-associated individuals where you do not ask for their name. In this way you increase the sales made to the associated people and you decrease the lack of sales to the non-associated. But how do you ensure that the right people go to the right page? Well that’s easy too – social media. On Twitter, for instance, you can use “broadcast” techniques which allow you to send the link to your non-associated audience. However, over at Facebook and LinkedIn, where your relationships are deeper and more direct, you post the link to the normal squeeze page which asks for their name. True, there will be some crossover but by sending the bulk of your audience to a squeeze page that has a name box or no name box depending on their degree of association to your product will increase your sales.